A view at the 17 mile post, Fraser River Waggon Road, B.C. 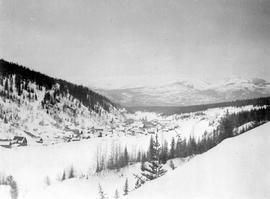 Atlin-Quesnel telegraph line; scene on the Nahlin River. Cariboo Road and Fraser River near Soda Creek, stereo view. Cariboo Road, Hell's Gate to Lytton; top of Jackass Mountain. Chilko Lake Looking South From Nemiah Point. Chilko Lake Looking West From Nemiah Point. Chilko Lake outlet looking south. Chinese men carrying freight up the Cariboo Road; Hannah Maynard and carriage down the grade; Cariboo Wagon Road, stereo view. 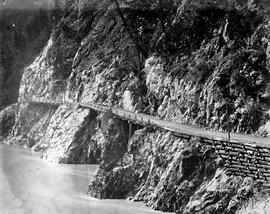 Dudadonta River; Atlin-Quesnel telegraph line. Floating island, Twin Lake; Atlin-Quesnel telegraph line. Fraser looking up, above Soda Cr. Freight wagons at Mount Pleasant; Cariboo Road. In the mountains above Barkerville.